Logins this hour: 24100 ? To set up Day-after rules, first click on a shift or service name on left-hand side of schedule that you want to establish a rule for. If you have a Provider/Health Professional platform schedule, locate the Infobox window and select Day-after rules. For Resident/Fellow platform schedules, go to Window menu along the top and select Day-after rules. There are two rule types: On rules ("must") and Off rules ("must not"). An "On" rule automatically places the staff member into the shift or service. An "Off" rule filters the staff member from your staffing list according to the rule. You may set both kinds of rules for each shift or service. The 7-column grid represents same day, next day, two days after, etc. It does not represent Sunday through Saturday. 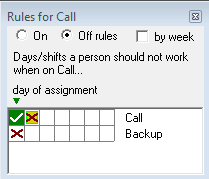 In this example, when a staff member is on call on a particular day, he/she can't be on "Backup" the same day and can't serve the same call the next day. The maroon "X" indicates when a staff member can't work. Notice in the example, that "M. Rover" initials "MR" does not appear in the selection the next day. Switch the Infobox window view to All Staff. You'll see a list of all your staff whether they are available or not. Staff that are unavailable are flagged with a symbol. The maroon X with a blue arrow through it is the flag for a rule violation. Select the staff member's name to place into the assignment. The flag continues to appear next to the staff member's name on the schedule. Violated rules appear flagged in the OnCall schedule, but not at Amion.com. 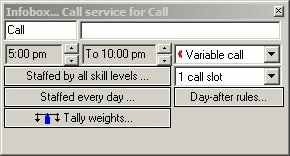 Also, you may temporarily turn off all rules by going to Options menu along the top and unselecting Pattern fill-call or Auto-fill call, depending on which scheduling platform you are using. Afterward, remember to enable Pattern or Auto-fill calls under the Options menu. Create Add-on rules when there is an exception to your "On" and "Off" rules. To enable, hold down CTRL key while you click on the maroon "X" or the green ✔ in the Day-after rule window. The Rule Writer window appears to create an "Add-on" rule. Use the bottom drop-down box to set the conditions of the rule. For example, if a staff member can't be on call the next day except for weekends, then select "Day of week" from the list. Then select Monday-Friday days. Once finished, the Add-on rule displays yellow in the Day-after rule. 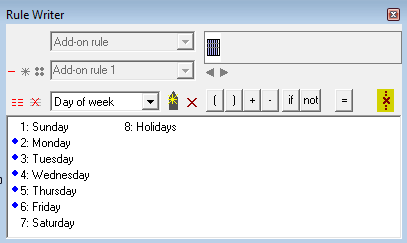 Select the by week option along the top of the Day-after rule window if the rule is weekly instead of daily. For example, use if you can't be on call two weeks in a row. Or if you can't be on Backup call the following week of call.